You can purchase WI Vinyl Collective, Vol. 3 here starting April 13. The LP Release event for WI Vinyl Collective, Vol. 3 will take place at the High Noon Saloon on April 13th at 8 pm. On the bill are Michael Perry and the Long Beds, The Mascot Theory, Bascom Hill and Lost Lakes. 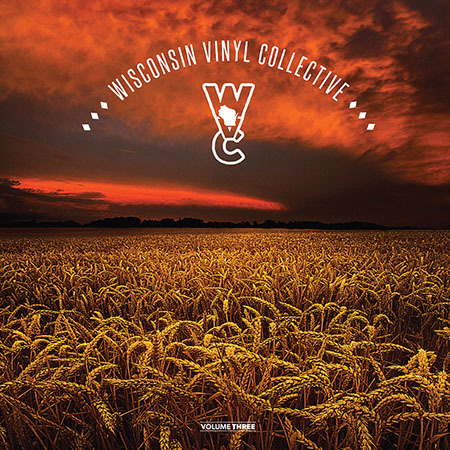 Wisconsin Vinyl Collective is proud to release WI Vinyl Collective, Vol. 3 exclusively through independent record stores on Record Store Day 2019 taking place on April 13. Erik Kjelland and Butch Vig are back as co-producers of the third installment in the Wisconsin Vinyl Collective series. The effort is colossal and serves to benefit the Wisconsin Keep Warm/Cool Fund, whose mission is to keep the heat and power on for those most in need in every community in Wisconsin. Like its precessors, volume three features previously unreleased songs from artists with strong Wisconsin connections. Kjelland and Vig are shrewd in conscripting unreleased material from a wide variety of artists that represent the state while straying from the confines of roots music, Americana and musical storytelling to include pop and post-rock elements. After a hiatus, Bascom Hill has returned in a trio format to kick off Volume Three. Distinguished by the smooth vocal of Charlie Victor, “Our Love Burning” is a finely sculpted song that could easily cross from folk-rock into country. “The Key” by Kerosene Kites is surprisingly electric thanks to the electric guitar of Beau Osland and the swirling keyboards played by Shawndell Marks. Erik Kjelland and Beth Kille duet on vocals, exploring some special effects on the middle section. Derek Pritzl and the Gamble contribute “Drifter,” a tasty slice of Wiscana that could be mistaken for a John Prine track. Lost Lakes appear in a band format with Rusty Lee and Shane Leonard joining Paul Mitch and Corey Mathew Hart on “Forgiveness.” Hart’s cool, synthed-out guitar and Lee’s organ add an air of psychedelia while Leonard’s drum pattern gives the tune a “Tomorrow Never Knows” vibe. This is a fine cross between dream pop and folk rock with glorious backing vocals. Singer-songwriter Madison Malone lives in L.A. now but the Portage-area native has maintained her strong Wisconsin ties. She’s in the right town to take her vocal and songwriting talents and modern pop explorations to a new level. Hugo Montecristo adds his voice and the duo lay down a soulful bed for Malone to display her range and control in the lead vocal. The sparse keyboard arrangement, programmed rhythm track and ample use of reverb sit this one squarely in the modern day. Kentucky native Christopher Gold now plies his trade from Appleton where he also has a band, the New Old Things. This is a solo performance, the only other musician being cellist Logan Lamers. “The Greys” is a song of gratitude, pure acoustic-guitar-singer-songwriter fare and a sweet tune. Laska features the three-sister vocal blend of Hannah Mae, Bex, and Mookie Morton. “Remained Consumed” is a captivating track, building from an single electric guitar arpeggio and vocal to a crashing electric firestorm with Andrews Sisters harmonies. Inventive passing tones and splashes of dissonance give this group a truly unique, genre-defining sound. Coupled with the smart introspection of so many driftless area artists, Laska is a band to check out. A three-piece string section and acoustic guitar accompany an impassioned vocal from Eric Cox on the haunting “The Last Stand,” from Sheboygan’s the Belle Weather. This is a terrific song with powerful lyrics recounting the conflict at Standing Rock. Craig Baumann is no stranger to Madison both as a solo performer and with the People Brothers Band. Few can match his intense, soulful vocal delivery. When coupled with his blues-informed guitar Baumann is powerhouse. Here he teams up with another one of his projects, the Overserved Gentlemen. The rootsy, bluesy “Sister Jules” even throws in a little whistling for good measure. Michael Perry and the Long Beds close out the album with “Threads.” This one is pure poetry, an homage to Spring melt. A spoken-word vocal line accompanied by a sparse arrangement and beautiful fingerpicked guitar. A touch of humor, a fair bit of fatalism, and if one listens closely, perhaps finding that thread in the poetry that connects a melting heart to the spring robins. Mastered by Jake Johnson at Paradyme Productions, and featuring another spellbinding photo from Phil Koch Photography, Wisconsin Vinyl Collective, Volume Three is another diamond in the rough. Take all three volumes together and there is a fine cross-representation of Wisconsin musicians. This is a labor of love from Vig and Kjelland, one that is most welcome, with the best of intentions and giving hearts.